Three years ago (tomorrow), without a clue to be had, I hit publish for the first post ever on The Baker Chick. 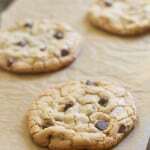 I knew I enjoyed reading other people’s blogs and I loved baking, so I figured why not have a blog of my own? Did I have any idea what it would really involve? Nope. Did I know anything about food photography? Not a thing- (as you can tell from perusing those early posts.) I did know that I wanted a new creative outlet and from the get go I loved having this blog and all that it involved. Over the last three years I have learned a ton, both as a baker and as a member of the blogging community. I’m not good at social media, I still have a long way to go on my photos, and my blog certainly isn’t the most popular one out there, but I sure do love it. I am still so incredibly grateful that anyone finds what I have to share relevant and for that I thank YOU! 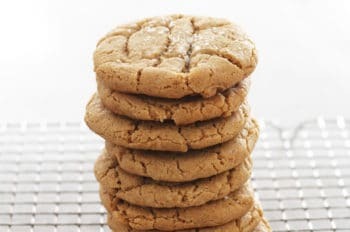 To celebrate the occasion, I thought I’d challenge myself to try a new-to-me technique that has been on my baking bucket list for ages. I’ve decorated cupcakes and cookies with roses in the past (and it’s really pretty easy,) but I always found these lovely cakes a bit daunting. Well- I’m all about challenging myself this year so I thought it was time to give the old rose cake a try! Dare I say its WAY easier than I thought it would be? I was convinced this looked awful but the roses are actually super forgiving and and even the not-so-perfect ones end up looking lovely in the end. (Thank you Amanda for your helpful tutorial on the technique!) Underneath the rosy frosting can be any cake you’d like. I thought of using this Easy One-bowl Chocolate Cake just because it’s so simple, but in the end decided on a new-to-me yellow cake recipe. A good, moist yellow cake is a must in any baker’s recipe archive and since I didn’t have one I thought this would be a good opportunity to try. Man oh man is this recipe good! In my opinion it is the ultimate yellow cake recipe that I will surely be using for birthday cakes for years to come. It is full of flavor with the perfect texture and crumb. It was excellent with this vanilla buttercream but of course a simple chocolate frosting would be yummy as well. 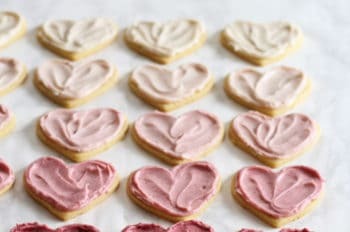 This lovely rose frosting can be done with any flavor combo of your liking and trust me when I say that if you can pipe a circle you can do it! I can promise this is hardly my last time experimenting with the technique because it looks like you’re an expert cake decorator when you’re really not. (Like me!) Thank you my dear readers for 3 wonderful years, I hope that I can continue to have good ideas of things to share- sweet treats of course, and now also a spattering of savory recipes and updates on being a Mama. I love you!! To further express my gratitude- I’m giving one reader a $50 Amazon gift card! In the past I gifted a few of my favorite kitchen things, but this year I’m letting you do the choosing. To enter- Simply leave a comment below! Feel free to give me some feedback and what you’d like to see more/less of in this next year. Sift together flour, baking powder, baking soda, and salt in a medium bowl. In a large mixing bowl, beat butter and sugar in a large bowl with an electric mixer at medium speed until pale and fluffy, then beat in vanilla. Add eggs 1 at a time, beating well and scraping down the bowl after each addition. Add flour mixture in three batches, alternating with buttermilk, starting and ending with flour. Mix until each addition is just incorporated. Spread batter evenly in cake pans, then tap or drop pan on counter to eliminate air bubbles. Bake until golden and a wooden pick inserted in center of cake comes out clean, 35 to 40 minutes. Cool in pan on a rack 10 minutes, then run a knife around edge of pan. Invert onto rack and discard parchment, then cool completely, about 1 hour. Cream butter until smooth and creamy. Add 6 cups of the powdered sugar an mix until thick and dry. Add vanilla extract and gradually add the milk, one tablespoon at a time. Add the remaining powdered sugar and any additional milk as needed until mixture is thick, creamy and slightly stiff. The cake pictured above is made from 1- 8 inch round cake sliced in half and filled, frosted. (I made 2 cakes, one rose frosted and one frosted more smoothly.) You could either half the recipe or make one super large cake. 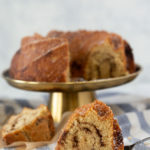 I have to say your blog has become one of my favourites to check in on for some great baking recipes. I have tried a few and loved them all. Congratulations on three years as a blogger and of course congratulations on the arrival of your little one! Congratulations on 3 years! I think I started following you about 2 years ago – just before your wedding! You’ve inspired me to make a rose cake for V-day tomorrow! Wishing you much more success!! Wow this cake looks so elegant and professional! I really might have to try this- even though it looks crazy intimidating! Wow this cake looks so professional! I’ll be looking for an occasion to make this cake! I love the 1M frosting tip, it’s so easy to decorate a cake with it! Congrats to your blog anniversary milestone. This cake is absolutely gorgeous and I love any type of posts. Happy blogaversary (almost)!!! :P You’re one of my fave blogs, Audra, trust me you are doing MORE than alright! And omgoshhhh such a gorgeous cake-you did an amazing job!! This is beautiful!! I love all of your posts and recipes; every one that I have tried has been delicious! I can’t wait to try this rose technique— its awesome! Congrats on 3 years blogging! I’ve been following for quite awhile and enjoy so many of your recipes…I always have great success with them. Thanks for a great giveaway! Awww this is so pretty! I love the roses! I’d love to keep seeing more of your beautiful baking creations – they are always my favourite of your posts! Was that really three years ago?! I’ve been (quietly) following along since the beginning and have made so many yummy recipes from here over the years. Whenever I want a new cookie or cake recipe, this is where I come. Congratulations on three years and love the roses!! Your cake is absolutely stunning, Audra!! Congrats on 3 years!! Congratulations on your blog! I just found it this week and love it! 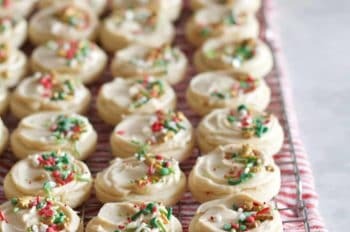 I love how simple and easy you make baking these wonderful desserts! My husband has been full and happy since I havebeen trying out your receipies!! Congratulations! This looks delicious!! I’d like to hear your birth story. :) Other than that I enjoy your blog as it is! Beautiful! Congrats on year three. I love this yellow cake recipe from Smitten Kitchen too. I used it to make my 100th post chocolate chip cake. I stumbled upon your blog and I’m so glad. Love the baking and the tidbits you write about. Congratulations On your anniversary!! The perfect yellow cake, eh? Now this I need to try!! And your roses look PERFECT. I have just recently started reading your blog and I’m loving it! Thanks for all your hard work! The cake is beautiful! Congrats on 3 years!! I think your doing a great job! Just keep the recipes coming! Congrats on three years! 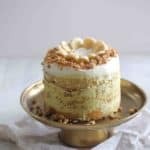 I love your blog and come here for all my baking inspirations. 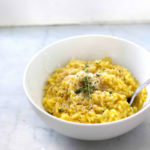 Your recipes are wonderful, your photography is stunning, and your posts are so personable. Thank you! Here’s to many more phenomenal years! This way all the grandchildren can have a flower! Can you teach me? What a beautiful cake!! And happy blog-anniversary to you! This cake is PERFECT! I’ve done the rose thing on top if cupcakes before and I was stunned that it was so simple and kicking myself for not trying it sooner. Crazy that it’s been 3 years! Congrats!!! love love love the blog new to it within the last month or so but love it! This is beautiful! and so is Hugo! This is so so so pretty, Audra. Perfect for Mother’s Day! I loooove your blog! I recently started following you. I am a knew mami myself of a beautiful 3 month old, and I really don’t know how you have the time to continue posting beautiful recipes with a newborn. Hugs! I have loved your blog for quite some time. This had been on my list to try also…I thought this spring would be a great time to do it. Happy Blogaversary! I love piping frosting, but I always end up with a huge mess and not pretty looking frosting. I think I need tons more practice and this beautiful cake is the the thing! Thanks. I just recently made one of these cakes for the first time and you are right, very easy and very forgiving! Good job! Beautiful cake Audra!! Congrats on three years. I love your blog. Congrats on your baby son & your blog anniversary! I’m new here, and have already made the Chocolate Cupcakes for Two. They were easy peasy and delicious. Love that they came together without a fuss or an egg! The rose cake is gorgeous. I’ll surely be back. This looks gorgeous! And I agree regarding the cake recipe; I’ve been using it ever since I saw it on smitten kitchen’s blog a few years ago. congratulations on 3 years of blogging. I would like to see more savory baked goods. Congrats on your 3rd anniversary. Love following your blog. Such a nice mix of recipes and personal touches – like having a new friend. Enjoy being a mom. Hope your little guy has a life filled with good health and happiness. I look forward to reading your blog and seeing what’s new! Congratulations on the beautiful boy! and your blogging anniversary. I look forward to more happy blogs!! Happy 3 year birthday, Baker Chick! I enjoy reading your blog and testing out your recipes in my own kitchen whenever I have the chance. Here’s to many sweet years ahead! Hooray, hooray! Three cheers for three years, and your new family of three! What a wonderful year this has been for you so far, Audra. So happy for you!! I’m a relatively new subscriber to your blog, and I’m enjoying every post. Congratulations on 3 years blogging! I love the cake and absolutely HAVE to know how you did the roses. It looks so beautiful! This cake is beautiful and your blog is one of my absolute favorites! Congratulations on three years and your new little one! Happy blog birthday! This cake is gorgeous – I attempted something like this for my daughter’s 3rd birthday last year and it looked like…well, let’s just say not like your lovely creation. Keep the tasty recipes and beautiful images coming, and enjoy year 4! Your ale is beautiful. I have only recently discovered your blog but I am enjoying it so far. Congratulations on your baby boy! 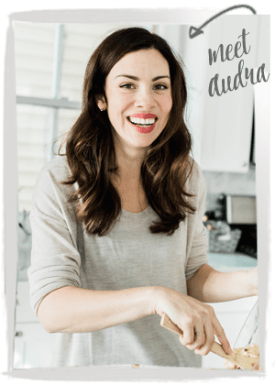 Congratulations, Audra, on three years of blogging (is that even a word???) You are so great at what you do and I always look forward to each and every newsletter. Thank you, too, for sharing so much of your personal life with us. It was so thrilling to read about the birth of your baby, Hugo. I think we all looked forward to it as much as you did!! It’s a real gift when you can draw your readers into your blog and your life to a point where we all feel like family <3. Many more years of continued success with "The Baker Chick". What a beautiful cake! I am definitely going to try it. What a stunning cake to have in honor of your new little one’s First Valentine’s Day. Enjoy all the little moments! 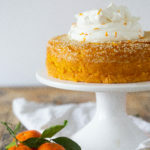 I love the blog and this cake is sooo pretty! Great job! Loving your blog. Thanks for the giveaway! I’d love to see lots of baby and some more savory! Congrats!! Love your blog! 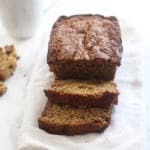 Do you ever post gluten-free baked goods? Thank you so very much for all of this. That is a beautiful looking cake! I want to congratulate you on becoming a mum too. The cliche is so true about how fast it goes after the first week (we’re alone in our bubble is the world still going on as usual haze), I still cannot believe my baby is finishing her second year of college right up there in NYC. The last time I looked, she was just learning how to escape her crib… I guess she did. So congratulations to you on many fronts, and I wish much joy to you and yours. Happy Anniversary and that cake is gorgeous! Happy Anniversary and Congratulations on your sweet little one!! I have made many of your recipes and they have all come out so well. Always get lots of complements on them. I love your blog so much! 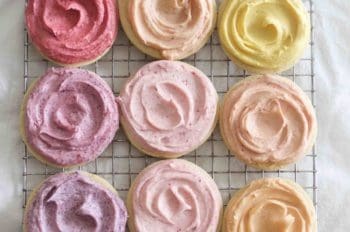 Every time I want to bake something (which is a lot) I check your blog for something to make first, and I find what I’m looking for almost every time! I think I might try out this cake today for Valentine’s Day. Congrats on your blog’s anniversary! What a pretty cake! My favorite color! Looks devine! Happy Blog Anniversary!! Your cake looks very beautiful and I love the bright pink frosting. Amanda’s rose technique is also on my bucket list to perfect. I’m so glad I found your blog a year ago because it is now one of my favorites to read and I am always inspired by your photographs. Hey Audra! I’ve been following your blog forever and I never made a comment ituo now, I can’t believe you have a cute little baby now because I still remember your wedding pictures! You travel and bake and are truly one of my inspirations! :) I want to comment because I want to let you know that this is such a great blog and I look forward got updates next year on your newer steps to life. You don’t have to change anything but I will love it anyways! Happy Blog Anni, Happy Valentines, Happy Baby Boy! Beautiful cake, and I haven’t tried one of your recipes that hasn’t been yummy. Thanks for sharing with us all. Audra, you are amazing! Thanks for three years of wonderful, inspiring, beautiful posts. Have a wonderful Valentine’s Day, too, with your family! I love this blog and have followed it pretty much from the beginning. My husband and I have many favorites from it! I’d love to see a few easy meals you’re throwing together as a new mom – because I’ll be one this fall and need some inspiration! (also, your baby story because it still kills me you delivered at home). Big fan of yours and look forward to seeing what comes next. I do like your blog. 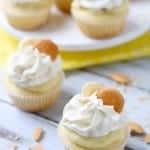 I think I will try this as cupcakes so I can give some away. Please enter me in the gift card give away. Thanks! I have to say, for someone who can’t cook, I really love following your blog and fully reading all your posts. I love your pictures and updates on your personal life so much. Also, your son is absolutely perfect. Congrats! I also love the cake. Maybe I’ll try my hand at making it! Thank you! Looking forward to trying this – esp. the roses! Thanks for sharing such great recipes and your experience. Wishing you and the little one well. This rose cake is absolutely beautiful. I keep hearing that roses are not as intimidating to make as they look, but I haven’t gotten around to trying it – probably because I have maybe only used proper frosting bags + tips about once in my life. But someday! Congratulations Audra on everything you’ve accomplished with the blog in three short years. I’m SO proud of your creativity, energy, and talent! The Baker Chick has re-inspired me in the kitchen in so many ways and re-kindled an appreciation of the value of homemade. It is my definite ‘go-to’ for anything baked. Keep it coming! Thank you for sharing, your blog is an inspiration as I’m trying to grow mine as well! Would love to see gluten-free options when possible! I love your blog! All of your food is beautiful and this cake is no exception. I would love to see more berry dishes in the coming year. Congratulation! I love reading your blog and I can’t wait to see what your upcoming posts have in store for us. Your cake looks beautiful, I like this icing technique a lot I think it looks so pretty. Congrats on 3 years! The rose cake is beautiful, just like the baby pics! Congratulations! The cake looks amazing!! Beautiful! And the cake looks delicious. It’s surprisingly difficult to find a great yellow cake recipe, so I look forward to trying this one! Congratulations on the blog anniversary and the baby! Congratulations on 3years! This cake is so pretty. A GIANT happy blogaversary! You’ve achieved some excellent success here, you should be terribly proud, chica! I can’t wait to try to make this cake. Yours looks beautiful! I was just wondering, is the frosting recipe listed enough to make both cakes rose frosted, or would I need to increase it?